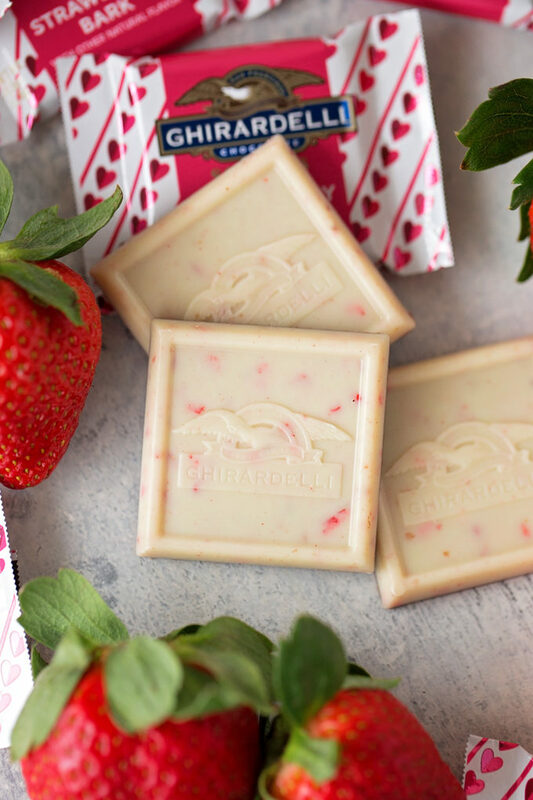 I’m partnering with Ghirardelli to bring you today’s recipe. Thank you for helping me work with brands I love! 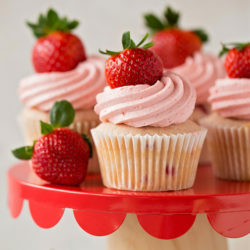 All-natural strawberry cupcakes with strawberry white chocolate buttercream. 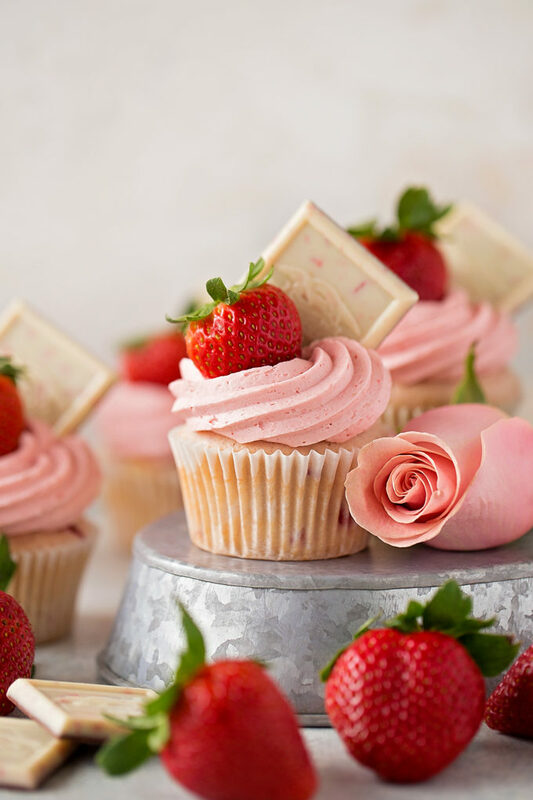 These pretty pink cupcakes are perfect for Valentine’s Day, Easter or summer celebrations! One of my favorite cake flavors from my childhood was strawberry. You know, that bright pink boxed mix? Yes, that’s the one. I still kind of love it. 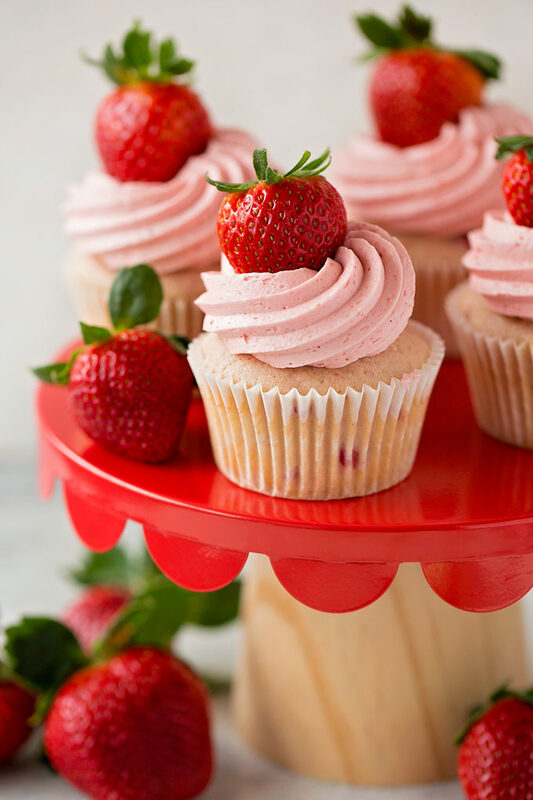 I wanted to recreate those strawberry cupcakes in a all-natural homemade version. 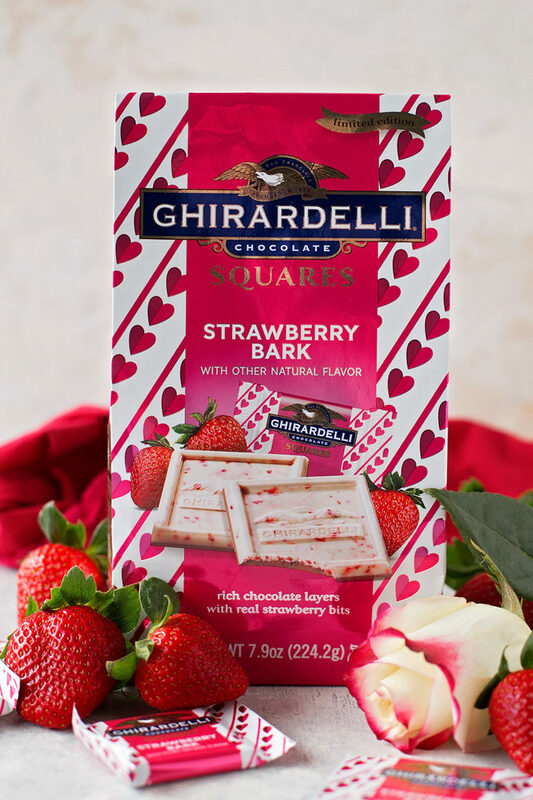 These are light, sweet and full of strawberry flavor! 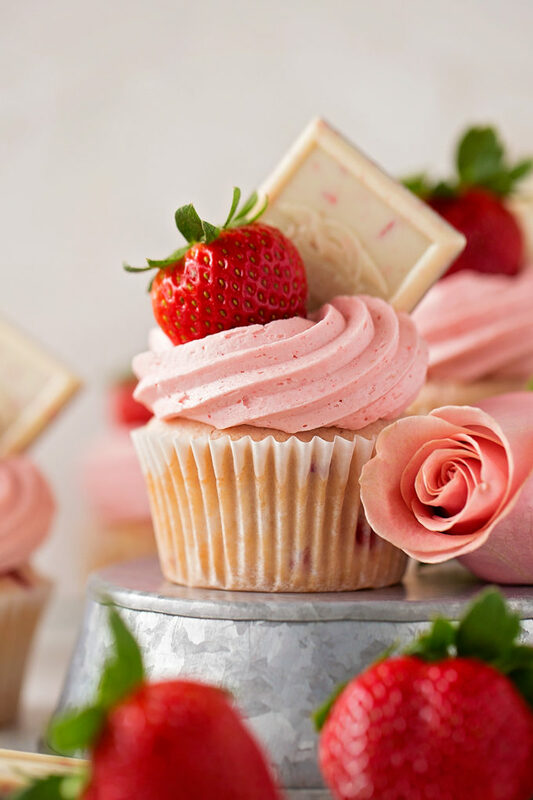 I topped these gorgeous pink cupcakes with a juicy strawberry and a square of Ghirardelli’s new strawberry bark. Not only did they look like they just came out of the case at an upscale bakery, but they tasted like a million bucks too! P.S. if you haven’t tried that bark yet, go get some! It’s rich, velvety and flecked with real bits of strawberry. So good!! 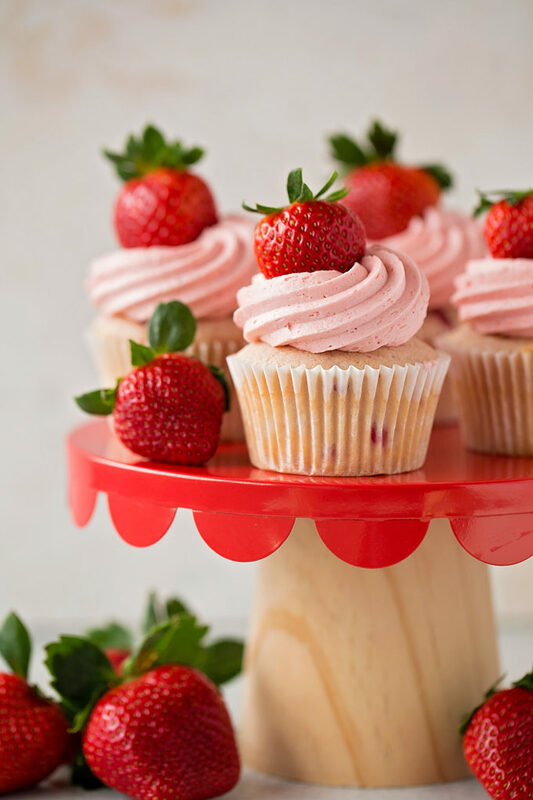 The trick for getting light, airy cupcakes with an intense strawberry flavor is using freeze dried fruit. Yep. Those cardboard crisps get pureed into a bright pink powder that packs a serious punch. Not only do they flavor the batter, but they also flavor the frosting. You’ll need 1 2/3 cups of sliced freeze dried strawberries. Check out the note section in the recipe below for suggestions on where to find them. I wanted to mimic the white chocolate layer of the bark a bit for the frosting, so I added some melted white chocolate to it. Absolutely divine. I could not stop “sampling” this frosting! Don’t panic when you read the instructions for the frosting. It is a bit tedious but I promise it’s worth it. Of course if you’re in low on time or ingredients you could always opt for cream cheese frosting or vanilla bean buttercream. I hope you’ll love these strawberry cupcakes with strawberry white chocolate buttercream as much as we did! They’re oh so sweet and pretty in pink! Preheat oven to 350 degrees. Line a standard size cupcake pan with liners, set aside. In the bowl of a stand mixer (or a large mixing bowl with a hand mixer), beat the butter and sugar until light and fluffy, about 2-3 minutes. Add the egg whites one at a time, mixing after each addition. Add the vanilla extract, mix to combine. In a medium mixing bowl, whisk together the cake flour, powdered strawberries, baking powder, baking soda, and salt. With mixing speed on low, gradually alternate adding the dry ingredients along with the sour cream and milk. After all of the ingredients have been added, beat on medium for 15 seconds. Gently fold in diced strawberries. Using a large cookie scoop (#20 or 3.5 tablespoons), fill each of the liners with the batter. Place in the oven and bake for 18-22 minutes or until the centers are set. You can use a toothpick or cake tester to ensure that they are done. Remove from the oven and allow to cool in the pan for 5 minutes before transferring to a wire rack to cool completely. Meanwhile, to make the frosting, in the bowl of a stand mixer fitted with the whisk attachment (or a large mixing bowl using a hand mixer and the whisk attachment), beat the butter until smooth and creamy, about 1 minute. Add the powdered strawberries and turn the mixing speed on low. Gradually add the powdered sugar along with the raspberry puree, white chocolate, whole milk, vanilla extract, and salt. Turn mixing speed up to high and beat for 3 minutes until fluffy. Chill in refrigerator for 15 minutes before using. Using a pastry bag fitted with a large piping tip, pipe the frosting onto the cooled cupcakes. Top with a fresh strawberry, if desired. To make the strawberry puree, in a small saucepan set over medium heat, combine 1/2 cup of diced strawberries along with 1 tablespoon granulated sugar and 1 tablespoon water. Cook until the mixture becomes thick, almost jam-like. Remove from the heat and press through a mesh sieve to remove the seeds. Let the mixture cool for 10-15 minutes before adding it to the frosting. If you need to, you can refrigerate it to help it cool in a timely manner. – These are naturally dyed. If you want a more vibrant color you can use a drop or two of red food coloring. – You can find freeze dried strawberries at most well-stocked grocery stores. They are usually by the raisins, prunes etc. Simply Balanced (Target), Trader Joe’s, Natierra Nature’s All, 365 (Whole Foods) are all options.